Russian Movie: The Tale of Tsar Saltan! 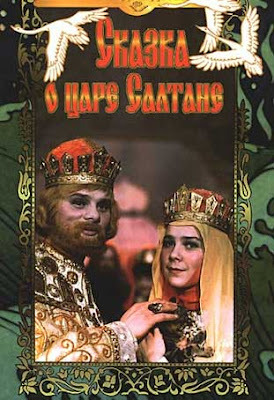 This weekend we will watch a soviet movie for kids “The Tale of Tsar Saltan”. This movie was made in 1966 and is a screen version of famous fairy tale of A.S.Pushkin the full name of the fairytale is “The Tale of Tsar Saltan, of His Son the Renowned and Mighty Bogatyr Prince Gvidon Saltanovich, and of the Beautiful Princess-Swan”. Director of this movie is Aleksandr Ptushko. Whom we know as director of “Ruslan and Ludmila” movie made also by A.S. Pushkin fairy tale. The movie “The Tale of Tsar Saltan” is expressed by poetry of A.S. Pushkin. We will watch “The Tale of Tsar Saltan” like always with English subtitles. Here is a link: The Tale of Tsar Saltan! This entry was posted in Movie for the weekend on June 13, 2010 by admin.